Imagine visualizing that new swimming pool on your wishlist before excavation has even begun. Now your backyard oasis can come to life right before your eyes with the latest in pool design technology: 3D pool design. Seeing a 3D rendering of your pool or spa helps you to visualize the final result before digging begins, ensuring that it suits your backyard and your lifestyle. When searching for a pool builder, make sure you choose one that can provide this service for you. What Are the Benefits of 3D Pool Design? Not all pool designs are created equal. With 3D pool design, you can make edits and adjustments on the fly. Pool construction will follow the 3D pool design ensuring accuracy and efficiency. Easily share the 3D design with others that can help with your planning, creativity and excitement. A 3D rendering is a true-to-size pool plan built with the use of software. It’s much more realistic than a 2D drawing and is better suited for customized designs. With 3D design, you can plot out the landscape around your pool and patio. Bringing backyard beauty, shade, color and deck ideas to life has never been easier. 3D designs are excellent for complex backyards. Outdoor spaces that are uneven, hilly or oddly shaped can be difficult to visualize on a flat piece of paper. 3D renderings offer substance and intuitively bring the space to life. Find inspiration by viewing our 3D Design Gallery! How Do 3D Pool Designs Work? 3D rendering is a creative process that is similar to photography or videography. We can light, stage and produce the imagery desired. 3D rendering is the future of technology and one of the fastest growing industries today! 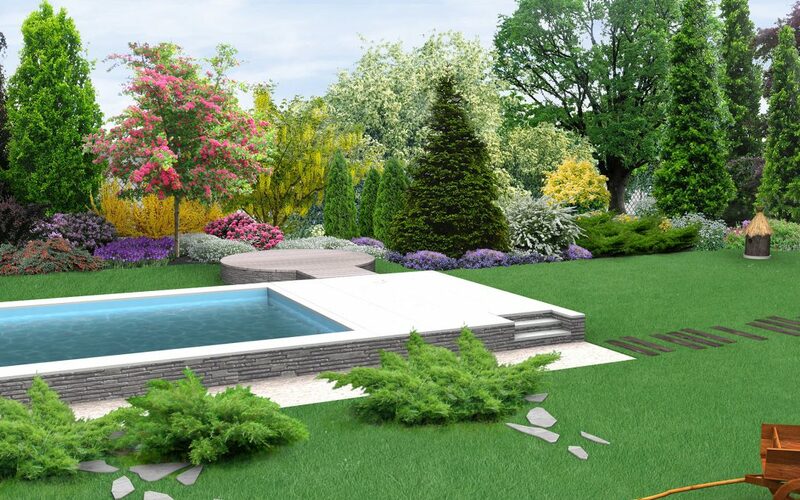 Our 3D design software allows us to work together to create the backyard of your dreams. We can create a deck or a patio, place a fire pit or an outdoor kitchen, provide lush landscaping and, of course, a highly-customized pool design. We start by recreating your existing yard so that we can render a plan that will reflect the true dimensions. To do this, we start with a visit to the home. This allows us to gain insight into your wants and needs, understand your space and take measurements. When the 3D design is completed, it will then be shown to you and any requested changes can be made. How Accurate Do 3D Designs Need to Be? During the layout process, we take the dimensions of the pool design from the 3D rendering and physically lay it out onto the site. This provides an ideal opportunity to make any changes to the size or the location of the pool before excavation begins. The excavation phase includes preparing the site for construction by breaking ground. Steel and wood are used to form a solid foundation for your pool. This will serve as the framework to ensure structural integrity. Next is the installation of the electrical and plumbing elements that meet all city and state codes. The gunite is the inner part of your new swimming pool. Gunite pools use a rebar framework that is sprayed over with a concrete and sand mixture. There are a variety of surfaces that can be used for the decking based on your design choice, from SprayDeck material to custom stone or stamped concrete. You will have your choice of natural stone tiles, slates, ceramics, or mosaics for the tile and coping. Plaster is blown onto the gunite and requires a quick, experienced and hard working crew to smooth the surface to assure a beautiful finish. By having your pool construction project done properly, you can ensure your Quality of Ownership Score will remain in good standing while positively impacting the long term value of your home.